The new Play Fair Code website is available to all our members, partners and visitors at www.playfaircode.at. On the occasion of the re-election of President Christian Hinterberger the Play Fair Code was invited to deliver a key-note speech. The Erste Bank Eishockey Liga (EBEL) and Sportradar are cooperating since October with a comprehensive monitoring package covering all EBEL competition games. Following an invitation of the Russian government, the Play Fair Code accompanied Stanislas Frossard (Secretary General of the Council of Europe, EPAS) to the international sports conference "Russia - Country of Sports" in Vladimir (Russia). Between November 2015 and September 2016 all the 32 youth teams of the Erste Bank Eishockey Liga (EBEL) were trained on the subjects of integrity in sports and match-fixing. 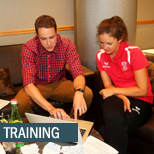 In mid July the Austrian Olympic athletes gathered at the Marriott Hotel in Vienna for their information day. In cooperation with the Austrian NOC and the IOC the Play Fair Code took the opportunity for a test run of the new IOC E-learning program against match-fixing. In memoriam of former football pro Bruno Pezzey the 20th Bruno Gala took place in the Vienna City Hall on August 28, 2016.